It is 1943 and although the Second World War is far from over, there are men like art expert Frank Stokes (Clooney) who are concerned that the art treasures of Europe are in danger from the Axis powers. They are being stolen by the Nazis or worse still, destroyed in the collateral damage of battle. Allied Intelligence has discovered Hitler’s plan to steal the art from the occupied countries of Europe and display it in the proposed Führermuseum in Linz. Stokes persuades President Roosevelt that a special unit is required to save these endangered works of art. Stokes argues that an Allied victory will be empty if the finest art of Western Civilisation is lost. Months pass and Stokes finds six other experts to join the team. Americans James Granger (Damon), Richard Campbell (Murray), Preston Savitz (Bob Balaban) and Walter Garfield (John Goodman). A British expert, Donald Jefferies (Hugh Bonneville) and a French one, Jean Claude Clermont (Jean Dujardin) also join. 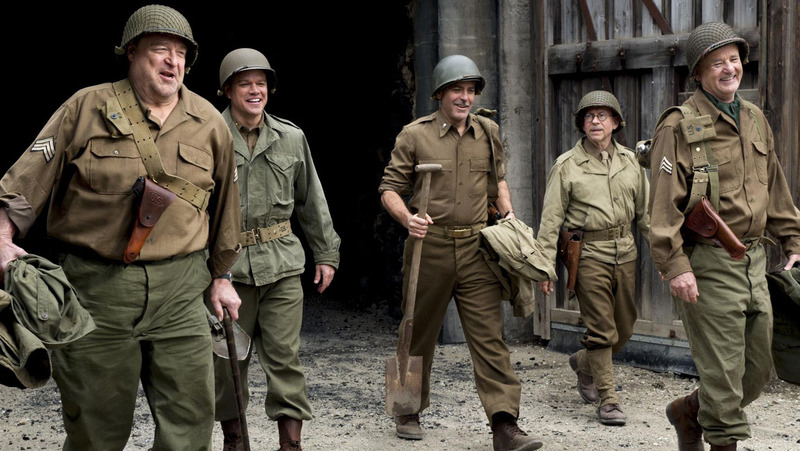 They go by the collective nickname “The Monuments Men”. After basic training in England, the unit journeys to Europe where the experts disperse to pursue different objectives. In Belgium, Jeffries goes after Michelangelo’s Madonna and Child. Campbell and Savitz search for the 12-panel Van Eyck altarpiece stolen from Ghent cathedral. In Paris, Granger tries to persuade curator Claire Simone (Blanchett) to share her knowledge with the unit. She has reluctantly witnessed the systematic theft of French art by the Nazis. It is March 1945 and Granger hopes to secure her help when he shows her Hitler’s Nero Decree which orders the destruction of German infrastructure as Allied forces make their way across Europe. Granger fears this will mean the destruction of all the looted artworks. For a history nerd like myself, I was excited by the premise of this movie. I wanted it to be like the trailer which sold me on the idea of a rag-tag bunch of academic types led by a grizzled Clooney fighting for the very preservation of Western Civilisation Itself! However, the actual film is a rather conservative affair with pacing problems and a shifting tone. The release of the movie was delayed as the balance of the comedy and drama, was hashed out. The drama is mostly adequate and sometimes good. The various war set-pieces are executed with the polish one expects after SAVING PRIVATE RYAN and BAND OF BROTHERS. The humour barely gets there. Alexandre Desplat, the award-wining composer is called upon to sell the dodgy comedy with his score. Damon is also saddled with some of the comedy and yet Dujardin is given nothing. Such are the decisions of Clooney and his longtime co-writer, co-producer Grant Heslov. I think Damon is great, but when you’ve got a sure-fire audience charmer and comedian like Dujardin on board, give him something to do! As much as I enjoyed individual scenes with these seasoned professionals doing their thing, overall I didn’t feel this was a strong and engaging film. It is occasionally entertaining in an way that reminded me of later era WW2 movies like VON RYAN’S EXPRESS (1965) or KELLY’S HEROES (1970), but without having anything like the same vitality. Although I believe the movie falls frustratingly between two stools, the Australian public disagreed and gave it the number one Box Office spot on its opening (St Patrick’s Day) weekend. Clooney’s film took $2,300,000 on 323 screens nationwide.